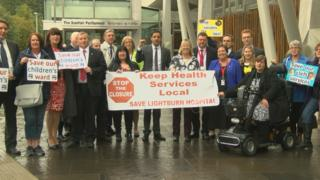 Opposition parties have defeated the Scottish government in a Holyrood debate on local health services. Scottish Labour put forward a motion urging the government to step in over a series of proposals to close or downgrade NHS services. Health Secretary Shona Robison insisted that no final decisions had been made about any of the services mentioned. But the Tories, Greens and Lib Dems united behind Labour, with the SNP abstaining in the final vote. The motion only calls on the government to step in over the plans, so does not bind the minority administration to any action. The SNP narrowly avoided a defeat over tax reform a week ago only after Labour leader Kezia Dugdale's vote did not register. Labour's motion for the NHS debate highlighted proposed changes to services at the Vale of Leven Hospital, the Royal Alexandra Hospital, Inverclyde Hospital, Monklands Hospital, Lightburn Hospital, the Royal Hospital for Sick Children and the Centre for Integrative Care. The party argued that the proposals "constitute major changes in service provision" and therefore should be decided on by ministers rather than local health boards. Opening the debate, Labour's Anas Sarwar said MSPs "can and should speak with one voice", and "put political partisanship to one side" over the issue. He said: "Our NHS staff are facing ever-increasing stress whilst services face the axe. We have to do something. These cuts will have a direct impact on them and on patient care. "I reach out across this chamber to other constituency MSPs affected by these proposals. Today we have an opportunity to put aside our party allegiances and work together to protect our local NHS services." However, Ms Robison said no final decisions had been made about any of the services cited in the debate, saying health boards were continuing to consult on them in the "proper and responsible way". She said there was an "established, robust process" in place to make decisions, saying Labour were "quite inappropriately" trying to cut across the work of the Scottish Health Council. She said: "This government remains committed to robust, evidence-based policy making. I am prepared to take difficult decisions where the evidence supports it. "What we will not countenance is change being dictated to local communities as has happened in the past under a Labour administration. "Local people can be assured that this government will always focus our approach on providing as many services locally as possible, and our record in government stands in stark contrast to that of the previous administration." Tory MSP Donald Cameron said his party would back Labour over the issue, saying the government should "at the very least take a view" on the proposals instead of "sitting on its hands". He said: "There is clearly a wider public interest at stake here. There is widespread public concern about the public services changes in issue. "Given the public concern and controversy surrounding these particular proposals they should all be classified as major services changes so that the SNP government takes responsibility for these changes and can be held to account. "We accept that tough decisions have to be taken, even when they are not popular, but what is difficult to fathom is the approach of a government which is content to do nothing." Green MSP Ross Greer also voiced concern about the service changes, saying "the pace of change is too fast". He said there has been a "lack of robust and meaningful debate", calling for "far more discussion" over the proposals. Mr Greer and Lib Dem member Alex Cole-Hamilton joined Labour members and local health campaigners at a rally outside parliament prior to the debate. Mr Cole-Hamilton said he found it "astonishing" that parliament had only been given time to debate the changes during opposition debates. He said there were "challenging decisions" ahead, but said the current debate was an opportunity for Ms Robison to "enlist us as champions" for the redesign of services. Ms Robison put forward an amendment defending the government's position, which was defeated by 64 votes to 62. SNP members then abstained on the final vote, with Mr Sarwar's motion calling for the changes to be decided by ministers passing by 64 to nil, with 62 abstentions. In a statement issued later, a Scottish government spokeswoman said: "The government has ensured that all proposals from NHS boards for any major change to services go through a proper engagement and consultation process, supported by the Scottish Health Council. "That process is a hugely important part of the decision making process, and it is important it is allowed to complete its work. "Following the conclusion of that process, and taking account of the views of parliament, we will report back to parliament on the designation of service change proposals."